From a one-day political strike in Chicago, to over two thousand union members discussing the fight back against attacks on unions and declining wages: Chicago buzzed at the beginning of April. 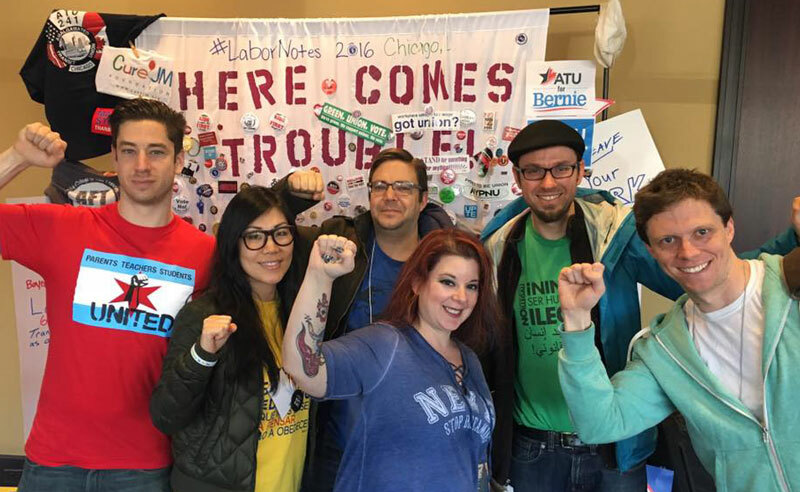 The Labor Notes conference, a weekend that brings together the left of the labor movement every other year, was dominated by politics as rarely before: On the one side, the Chicago Teachers’ Union set the tone with a political strike, demanding $6 billion from taxing the top 5% to fund education and social needs on April 1. On the other side, Bernie Sanders campaign revealed the anger in labor about the constant cover up of conservative union leaders to spend millions for corporate Democrats, throw labor’s weight and our resources behind a Walmart candidate like Hillary Clinton. Centered around the Labor Notes monthly publication which reports on union struggles across the country, the conference included union members from all regions in the debates on how to use this momentum, how to expand on new organizing successes and fight for 15 victories. International struggles from Japan, Brazil, and other countries were represented as well, but unfortunately not as strongly as in previous years which saw for example representatives of the National Shop Stewards Network from the UK offering inspiring models of organizing the left within our movement. The teachers striking together with fast food workers and mobilizing tens of thousands to the streets of Chicago – this dominated the Labor Notes discussion, both in the forums and workshops, as well as informal conversation, also the first day of the conference. The strength of the CTU action was impressive. Just as inspiring has been CTU’s insistence on pursuing a community-based strategy for organizing, as well as the clear opposition to Rahm Emanuel and the Chicago Democratic Party machine. Crucial to the CTU’s fighting spirit was the success of the organized opposition of the Caucus of Rank and File Educators (CORE), who successfully took over their union leadership. This opened the door to community struggles against school closures, and led a 2012 strike that shook the United States. Since then, CORE’s example has been slowly spread to other teachers’ unions and the reform efforts within them. “Nepotism and bureaucratic unions are incapable of taking on the attacks teachers are experiencing,” explained one teacher – an idea taken to heart by teachers everywhere as reform slates dominated the discussions of teachers. New leaderships won in UTLA, the Massachusetts Teachers Association, and sent representatives who inspired the hundreds of teachers present at the conference. Labor Notes as a publication, along with the connections made at the conferences and regional days schools help CORE start the national United Caucus of Rank and File Educators (UCORE). This network has been crucial in exchanging ideas and strategies across cities and states where teachers unions are fighting drastic budget cuts and union leaderships that don’t want to fight. The 2007-08 recession marked a turn in labor relations, as corporations and governments went on the extreme offensive against organized workers. These attacks decimated the UAW in the auto industry and has only been slowed by the Battle of Wisconsin, Occupy, and, more lately, the Fight for 15. Setbacks through right to work legislation and other attacks on workers rights set the background for a huge challenge to build labor. The urgency to rebuild our strength and defend the working class was reflected most intensively by the young workers meeting. This gathering exposed the desperation and urgency of the working class today. Many young workers talked about lower wages, less powerful unions, and facing a corporate class on the attack. These workers were asking: “How do we understand the attacks we’re under, and how do we organize the fight back?” These workers were ready to hear new ideas and this meeting had a radical and energetic feel to it. Representing a change from previous conferences, the question of politics was out in the open. Labor4Bernie held multiple meetings and workshops, there was a workshop on “Doing Politics Differently” and one on “What is Socialism,” and Kshama Sawant spoke at the well attended LeftElect reception. As the presidential election shows [link to an article] there is enormous anger at status quo corporate politics which is expressed in the intense debate around unions endorsing Hillary Clinton, a former Walmart board member, or Bernie Sanders. While the call for a new party for labor received enthusiastic support from some sectors, it was coupled with the attitude that the right must be defeated at all costs, including voting for Hillary should Bernie lose. In answer, we should point out that Hillary defeating Trump or Cruz will not change the right-wing upsurge; we have to build the Fight for 15 and other movements around free education, single-payer health care and other demands, and build a party that runs candidates that will help build these movements. The question of how unions engage in elections is of vital importance, and at no time does it aid the labor movement to ignore this conversation. At this time the crucial question underlying political discussions is “what approach should be taken to the Democratic Party?” In Chicago, this discussion is being pushed by the outright hostility of Mayor Rahm Emanuel and the ruling wing of the Democratic Party to unions, working conditions, benefits, and contracts. However, there is not yet clarity. The CTU is banding together with a few other local unions to form “United Working Families” which presents itself as a political organization for the unions. It is a similar formation to the Working Families Party as it exists in New York and other places. Both organizations suffer from the same top-down control that the union bureaucracies insist on, for example, like SEIU which endorsed Hillary Clinton. The aldermen elected with the help of the “United Working Families” for example, are now all Democrats. It is not “United Working Families” who they are held accountable to. They do not use their position to promote a new party for the 99%. They are now part of the Chicago Democratic Party – one of the darkest places within the dark machine of this Wall Street dominated party. A new party should throw open its membership to the rank-and-file of unions and allow democratic discussion on a platform of demands, on what candidates to run and who to endorse, and what movements to be involved with. Aside from Kshama Sawant in Seattle, and the Richmond Progressive Alliance in Richmond, California, attempts have been few and far between. While the organizers of Labor Notes deserve enormous praise for bringing together this incredible gathering of rebellion against capitalist exploitation within the labor movement, they sometimes act too timidly. While everyone was talking about Bernie and the way forward, there was no organized discussion about the strategy to liberate the unions from the corporate prison of the Democratic Party. Even the Labor For Bernie meetings were chaired not in the spirit of open discussion, but for organizing the technical details of endorsements and GOTV in the next upcoming states. While this is very welcome, there also needs to be space for a more broad-ranging debate. Given the circumstances, this discussion had to find its way again and again through the participants in the workshops – rather than out in the open. However, in the end, Labor Notes is a meeting of activists, of self-described “troublemakers,” who train themselves to have these conversations in these, and harder, conditions. Labor Notes as a conference represents a unique opportunity for the left of the labor movement to build on. It is an opportunity to learn about struggles happening around the country from those involved. Similarly it is an opportunity to learn by testing out ideas with working people who have real influence in their workplaces and communities. In every workshop, Socialist Alternative members raised the importance of using demands for union struggles to reach out the community, and raised a conscious approach to elections, pointing out that unions cannot simply allow the corporations to dominate that part of discussion in society. Read more about the Labor for Bernie meetings here.